Chanel new with tag mini classic crossbody white wool knit , Aspen collection autumn 2015. Shoulder drop 24". Comes with hologram, tag, id card and original dust cover. 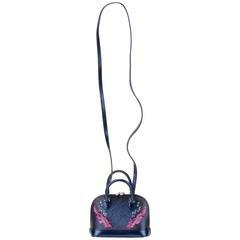 Dolce & Gabbana miniature von bag with Aruba design. Evening bag and crossbody. Handle drop 2". Shoulder strap 47". Comes with original silk dust cover.